I have been working for the same company for many, many years. When I talk to my friends from college, they ask me how could I be working for the same company for so long? I tell them I’m still having fun and still doing things that interest me. In asking them why they have hopped from one company to another, I often come to the realization that it’s not the company they dislike, but it’s their job. Digging some more, it’s clear that regardless of the company, they will very likely always end up disliking their job. Why? Because, they are missing one important ingredient, passion. For me, tinkering with computer “stuff” is something I’ve always loved. And it’s that passion that lead me to buy my first computer and made me sign up for my first Computer Science 101 class. That love is still there. Yes, I was and am still a proud nerd. Many people start just like me, though that passion erodes over time partially because of the jobs they end up taking but mostly because they decide that they are no longer happy and don’t make room in their daily job for things they do enjoy. This recent article in Inc. brings up a similar point: they complain about their job but don’t do anything about it. Maybe I have been lucky to have managers who have allowed me some wiggle room to explore new technologies, new ideas, and new methods to keep that passion alive. Example 1: back in the mid-90s, we used to create bug reports using a home grown app (there was no Bugzilla back then) running on an xterm-type of terminal. The Internet just started to emerge with technology like Apache and CGI. I pushed to start using it as a new front-end for the bugs system , and people are still using today. Though phased out for the RallyDev tool, it was fun to develop and watch it grow to 150,000+ logged bugs. Example 2: when I became a manager in early 2000, I realized that I wasn’t very good at the tedious job of keeping track of my team’s many tasks. Hence, I created “Tasks!”, a tool that allowed me to assign tasks to people, keep track of changes/updates (with email automatically sent to assignee and assignor), and monitor progress during the development and QA. At the end of the week, when meeting with my product manager, I had a nicely formatted report to share with him and talk about the week’s progress. I loved the tool because it took care of the things I didn’t like to do. I could provide other examples, but you get the point. Did my company breathe that passion into me? No. Would I be as passionate at another firm? Probably. At least, I would hope so. Did my company do something right to keep and nurture the passion alive instead of snuffing it? Yes! If you are a nerd like me, a jock or just an average Joe with a passion for computers, find a way to remain passionate about it and share that passion with your co-workers and managers. If you’ve found something new that you are excited about, find some time to explore it (at work or home) and share your findings/excitement with the other nerds around you. If you are a manager (or a company), please do allow your employees to spend an hour here and there to explore next technologies and share it with the rest of the group. Google has it right allowing its employees to spend 20% of their time on things that interest them. 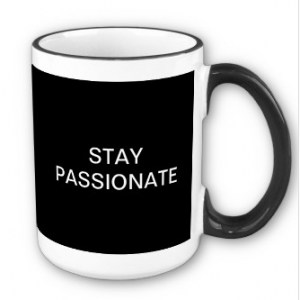 Bottom-line: Stay passionate and keep “it” alive! There’s gotta be a better way! Go take a shower, will you!